Appearance: Cloudy gold with a lasting foamy head. Nose: Wheat bread dough, citrus peel. Palate: Citrusy, slightly sour, with a little spice. Finish: Sour and a little bitter. Parting words: Griffin Claw is located in Birmingham, Michigan, the affluent suburb just north of Royal Oak, location of Sipology Blog HQ. Birmingham is a women with big hats and little dogs kinda place. Which makes the quote that appears at the top a little #problematic. It’s a quote from Elmore Leonard: “There are cities that get by on their good looks. Detroit has to work for a living.” I’m sure Leonard meant it as a tribute of sorts, but coming from a brewery in one of the wealthiest, whitest cities in the metro area, it sounds more like a dig than a compliment. That aside, there’s nothing wrong with this beer. It’s something I would order at the brewpub or someone else if I was in the mood for a spiced wheat beer. This is Michigan, though, and the competition here is fierce. If a brewery is going to make a beer in the style of the most popular beer from the most popular brewery in the state, it needs to stand out. Bluesky doesn’t. It’s not worth seeking out if unavailable near you. Mildly recommended. Appearance: Ruddy brown with a short-lived head. Leaves a thin, lacy layer of foam on top. Palate: Easy drinking but flavorful. Relatively fruity. Sweet, toasty malt, leather, plum juice. Finish: mixed berry, hops, roasted malt. Parting words: Bock is a style of beer that drinks like an ale but is brewed like a lager. It’s also one of my favorite styles. Bock has a long history in Germany but was hard to find in the US for many years. The microbrewer movement changed all that and now almost every small brewery makes one or more. The story goes that the style was originally made in the Lower Saxon town of Einbeck, but the name was corrupted to ein Bock (a billy goat) by brewers in Munich. That story sounds fishy to me, but beer history is not my field, so I’ll let it go for now. At any rate, most bocks carry a picture of one or more goats on the label as a play on the name. Doppelbocks (i.e. double bocks) are brewed at a higher ABV than the standard bock. They usually have a name that ends in -ator as a tribute to the first brewers of the style, the Paulaner Franciscan friars, who called their beer Salvator. Consecrator is a good example of the style, but as noted above it shows more fruit than most. It still works very well, though. I don’t normally buy beer that’s this expense (I admit that I probably overpaid), but this one is just worth the price. Consecrator is recommended. Style: Lager with Bloody Mary mix. Appearance: Moderately foamy, soapy looking head. Hazy orange. Nose: Sweet and malty. Tomato, tabasco sauce, celery salt. Palate: Full bodied and mildly effervescent. Spicy, sweet, tomato juice, pickle juice, pickled jalapenos, salt. Parting words: A Michelada is a beer cocktail. It’s served all over Mexico in different local styles, but it usually includes tomato juice, lime juice and often Worcestershire Sauce, hot sauce and/or soy sauce. In the US it often takes the form of a Bloody Mary made with beer, which isn’t really too far off after all. This is a joint project from Atwater Brewery and McClure’s pickle factory. After consolidating their operations in Detroit, they branched out to other non-pickle products. They have three varieties of pickle-flavored potato chips, they sell jars of their brine and they also have a Bloody Mary mix. The Bloody Mary mix has lots of fans, but I am not really one of them. There is way too much pickle juice in the mix, rendering it undrinkable (to me anyway) except when cut with V8. The can describes this products as “the world’s first craft Michelada”. It also recommends that it be served in a salt-rimmed glass or sipped right out of the can. I drank three out of the four cans in a standard 12 oz glass. It did just fine that way. I tried the fourth one in a salt-rimmed glass. It tasted ok, but I’m not sure if the salt added anything. I usually don’t purchase premade cocktails, but this one intrigued me and got a recommendation from a friend so I picked it up. I was not disappointed. The beer cuts the briny mix perfectly. It pairs nicely with greasy brunch food and Mexican food. The price is fair, and the cans are really cool looking. Atwater’s Michelada is recommended. Style: (Dark) Ale brewed with blueberries. Appearance: Dark brown, like cola with a bluish tinge. Nose: Burnt blueberry pie, asphalt, alcohol. Palate: Dark roasted malt, cooked blueberries. Finish: Pleasant. Bittersweet stout and blueberry pie. 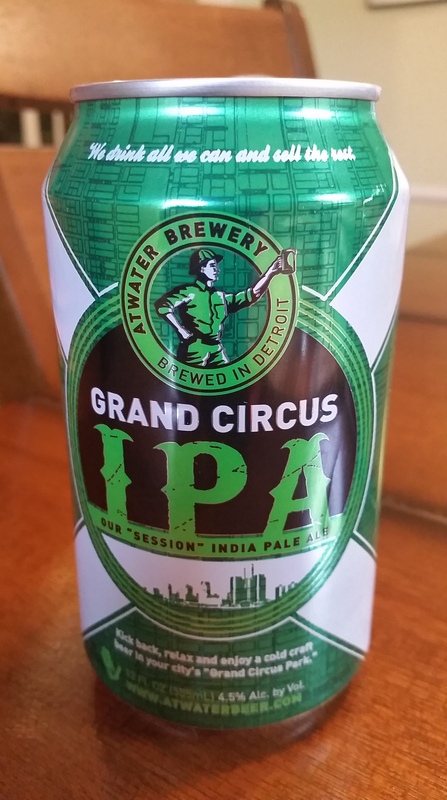 Parting words: I’ve been reviewing Atwater’s beers for years and they haven’t once made any sort of contact with me on social media or anywhere else. Not even a like or a favorite. That’s a little annoying but I don’t hold it against them. Some companies are good at social media and some aren’t. My annoyance in no way negatively influenced my review, but didn’t help either. This beer is OK, but the nose is really weird. It’s called blueberry cobbler, but it tastes much more like blueberry pie than cobbler. There’s no biscuity-topping flavors. It’s just all cooked fruit. 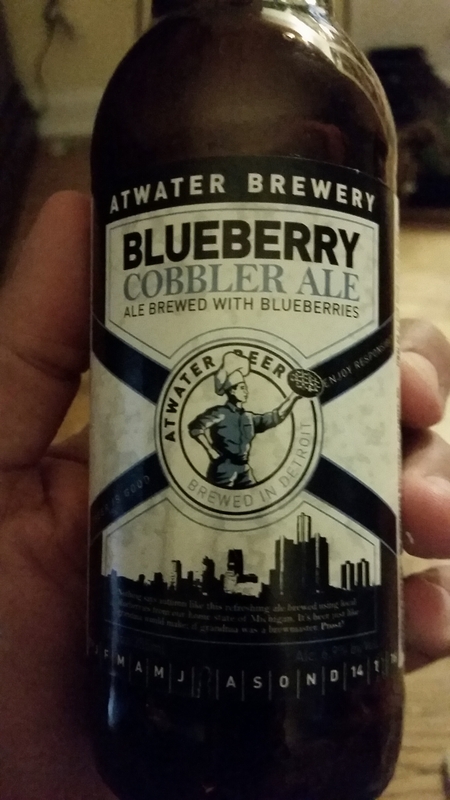 Heck, even the guy in the Atwater logo is carrying a lattice top pie, not a cobbler. Yes, it’s a minor quibble but it points to the confused state of this beer. There’s some blueberry in there but there’s not enough to make it actually taste like blueberries. I get that they were going for a baked blueberry thing here, but the toasty malt just makes it taste like the burnt drips that stick to the bottom of the oven after the pie is done. I like, nay, love most of Atwater’s beers but this is a failure. Blueberry Cobbler is not recommended.